What began as a vision – eyewear as an accessory – in 1964, is now the world’s leading brand in light and high-end eyewear: Silhouette. This brand produces the lightest eyewear in the world, with great attention to detail, a high degree of craftsmanship by hand and individual design. They are produced in Austria using the finest materials and newest technologies for export to 100 countries around the world. In 1999, Silhouette revolutionised the world of eyewear with Titan Minimal Art, a model free of screws, hinges and rims, weighing a mere 1.8 grams. Silhouette eyewear models have accompanied astronauts on 35 journeys into outer space. They can also be found touring all over the world with the Vienna Philharmonic and a whole series of other giants from entertainment, business and politics. All Silhouette eyewear combines technology and functionality with design and exquisite handicraft. This recipe for success was embodied in the Titan Next Generation Collection of 1998 – the first eyewear to be made of high-tech titanium and with screwless hinges – and the first impressive success story. In 1999, the Titan Minimal Art came into being, which revolutionized eyewear design to become what is today both a style icon and a legend. Thanks not least to the unique properties of high-tech titanium, for without what was then a revolutionary material in the eyewear industry, the design would not have been possible. Thanks also to the untiring spirit of innovation of the design and research and development departments and their constant search for new materials, the revolution in the eyewear industry was successful. Silhouette eyewear gets by completely without hinges or screws, since high-tech titanium is an extremely flexible and durable material. It is antiallergenic and thus optimally skin-friendly as well as extremely light, which accounts for the unmistakable wearing comfort of each Silhouette on the one hand, and allows for a particularly minimalistic design, on the other. And, high-tech titanium keeps its shape, day after day. Quality management of all materials has top priority at Silhouette and starts already with the careful choice of suppliers. Since only flawless base materials allow for compliance with the highest quality standards in the end product, the close examination of the delivered batches of material is a matter of course, as are constant quality controls following each step of the production process. Furthermore, Silhouette works with the supplier on the ongoing optimization of the raw material – it can always be just a little bit better. Around 100 precisely coordinated production steps are necessary to create a Titan temple from the raw materials, with up to 264 steps needed until a piece of eyewear is finished – approximately 80 percent is carried out by hand. Many of these steps take place in the tool manufacturing department, before actual production begins. Silhouette develops a large part of its machines and tools itself in order to be able to implement the design requirements with the highest, consistent quality possible. This unique symbiosis of high-tech base materials and genuine handicraft is what makes a Silhouette. The alloy is delivered either in wire form in various diameters from 0.8 to 3.2 millimeters or in sheets in thicknesses of 0.8 to 1.45 millimeters. Approximately 500,000 meters of raw material are processed each year by Silhouette. Even if there are slight differences at the beginning of processing, the material is then reduced, stamped, cut and bent. In an automatic cyclone polishing machines filled with a nutshell granulate and special polishing additives, the surface is deburred for up to 80 hours and then polished by hand. A time-consuming process that is completed with various coating processes and finally, the individual coloration of the high-tech material. During Silhouette's history of almost 50 years, the individual wishes and needs of people who wear spectacles have been at the core of its thinking and creating. A Silhouette is a masterpiece of minimalism, the epitome of tangible lightness and utmost wearing comfort. To make this vision become reality, Silhouette began the search in the 1980s for a material that made the promise of the brand palpable and visible in an incomparable way. The choice went to special polyamides – highly complex thermoplastics, that together with suppliers was developed into SPX®+ , the most innovative eyewear plastic to date. In 1983, Silhouette began producing eyewear made of this high-tech plastic with the innovative injection molding technique. The advantage was and is obvious: hardly any other material, hardly any other technique, had such great potential for possibilities and outstanding properties with regard to formal as well as colour design, functionality and wearing comfort. The wish for improved functionality and unlimited design possibilities moved the Research and Development team to continuously optimize and search for new material compounds. Today up to eight different polymer composites are used in the various eyewear components; they are synonymous for SPX®+ and for the incomparable design and wearing comfort of a true Silhouette. The world turns. And the world of eyewear turns with it. The big differences lie, as almost always, in the subtleties and details. Outstanding expertise, unique know-how, the detailed coordination of materials and a trend-setting surface technique are required in order to create the minimalistic elegance of Silhouette's eyewear design in its recognized quality and precision. Silhouette counts on the knowledge and experience gained from almost 50 years of manufacturing eyewear, and because of its use of eight different SPX® composites, it is undoubtedly a trailblazer in the processing of high-tech materials. Silhouette guarantees the highest quality standards starting from the choice of suppliers to the ongoing optimization of the production process. Annually, around 5,000 kilos of raw material in the form of transparent granule are sourced for the most part from Switzerland and Germany. An in-depth check of the materials delivered, as well as constant monitoring of each step of the working process, guarantee an end product, a piece of eyewear, of the highest quality. The actual production begins already in the tool manufacturing department, before the granule is processed, since Silhouette develops a large part of its tools itself thus turning the design idea into a finished model with consistent, top-notch quality. The colourless granule is dyed with the finest pigment powder and is processed into unfinished parts in a fully- or semi-automatic injection molding machine. The eyewear components are then placed in a whirling machine filled with special polishing additives for up to 80 hours long and then polished by hand. Afterwards comes the surface finishing with printing, painting or metallic coating. When all components are perfect, each piece of eyewear is then assembled – by hand. The joinings are heated up to the melting point, the materials fuse and after setting, are permanently joined. Different from soldering, where solder is added and which is only possible for the larger components, in this method the material purity and thus all the properties of the titanium alloy remain intact. “This method of joining guarantees the purity of the material – Silhouette titanium eyewear is truly made only of high-tech titanium that retains its optimum properties even in processing and handling,” said Spindelbalker. The smallest components, such as the 0.8mm-thin pins for the plug connection between the temple and the lens can be joint on with pinpoint accuracy. The pins are extremely stable and make the screwless mounting of the temple and lens possible. At Silhouette, this method is semi-automatic using automatic machines developed and constructed by Silhouette. Trained, experienced staff constantly monitor each step. 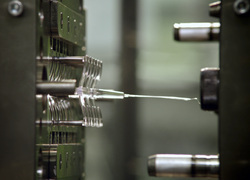 The advantages of using the high-tech material SPX®+ in the production of plastic eyewear are evident and verifiable: Unlike the traditional milling technique with acetate, SPX®+ allows processing by means of modern injection molding – either manually or fully automatically, depending on the model, in practically every shape and size. With two-component molding, certain types of SPX in various grades of hardness are bonded with another. For example, a hard temple wire is coated with a softer plastic, making the temples soft and smooth and comfortable. SPX®+ is extremely flexible, yet dimensionally stable – it is twice as strong as acetate and its specific weight is just1g/cm3 (acetate: 1,4 g/cm3). The balanced relationship between lightness and strength permits a unique puristic design with the best wearing comfort: delicate, light design, scratchproof and abrasion-resistant with improved functionality. The flexible, heat-resistant material provides perfect optical security the whole day long – that stays true to form with a comfortable fit. With SPX®+, pressure marks on the nose or behind the ears are a thing of the past. Plastics, in the course of their history, have become the epitome of unlimited malleability and colourfulness. SPX®+ is a transparent material that grants a unique brilliance of colour. 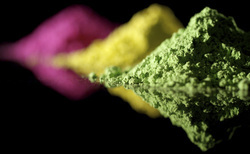 Fine pigment powder, measured precisely down to a thousandth of a gram, gives the SPX® granule the desired shade – from discreet natural shades to strong, bright colours. High-tech titanium gives temples the greatest flexibility and the bridge the required strength, according to the diameter of the material. High-tech titanium is antiallergenic, distinguishing itself by being highly skin-friendly. Silhouette eyewear made of titanium is the ideal choice for clients with contact dermatitis! High-tech titanium is super light and offers outstanding wearing comfort. High-tech titanium makes particularly delicate and minimalist design possible that is still highly resilient. High-tech titanium is so flexible that Silhouette eyewear needs no hinges or screws at all. The flexible temple molds itself to the contours of the head for a perfect fit. High-tech titanium can be optimally adjusted – unpleasant pressure marks on the nose and behind the ears are a thing of the past. High-tech titanium is corrosion and temperature resistant. Silhouette eyewear of high-tech titanium always keeps its shape and is maintenance-free. High-tech titanium offers endless possibilities in coloring. Whether high-gloss, semi-gloss or with color printing, the surface is UV-resistant and resistant to cosmetics. SPX offers unlimited shape and design possibilities, from super-flexible to high-strength, is always pleasant to wear and entirely free of sharp edges. SPX is twice as strong as acetate – for slimmer, lighter designs, improved functionality as well as extreme scratch and abrasion resistance. SPX is particularly flexible and dimensionally stable – it keeps its shape even at high temperatures guaranteeing perfect fit with the best possible optical integrity and optimum wearing comfort. SPX is super-light and guarantees optimum adjustment – made possible by the puristic design, unpleasant pressure marks on the nose and behind the ears are a thing of the past. SPX stands for unrivalled colour brilliance – it makes fascinating colours and surfaces possible, whether transparent or opaque, is absolutely UV resistant and resistant to cosmetics. SPX is stronger, more flexible and lighter than acetate and is also significantly more dimensionally stable (exact dimensions) thanks to its lower water absorption capacity. SPX is free of plasticizers and offers the utmost wearing comfort with no risk of allergy – finally skin-friendly eyewear that spectacle wearers with contact allergy can wear!